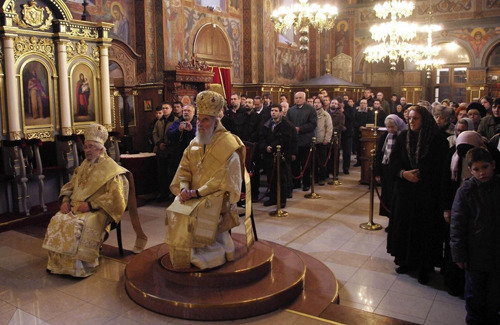 Belgrade, Serbia - His Holiness Patriarch Irinej of Serbia served on the feast of St. Theodosius the Great and Venerable Michael, on January 24, 2010, the Holy Hierarchical Liturgy at the church of the Ascension of Our Lord in Belgrade. Concelebrating with the Patriarch was His Eminence Metropolitan Christopher of Chicago and Libertyville, Presbyter Arsenije Arsenijevic, protopresbyter-stavrophor Milan Radovanovic, Milosav Radojevic and Radic Radicevic, protopresbyter Jovo Planojevic, presbyters Predrag Timotijevic and Vladimir Stanimirovic, protodeacons Tomislav Milanovic, Stevan Rapajic and Nenad Mihailovic, as well as deacons Jovan Milenkovic and Stefan Cincarevic. His Holiness Patriarch Irinej of Serbia addressed the faithful people, during the liturgy, that gathered at the church in large numbers. In his homily Patriarch Irinej emphasized the importance of repentance and forgiveness for our life in Christ, pointing at the Publican's example of true repentance in which we all are called. After the Holy Liturgy, His Holiness headed to the Rakovica monastery where he served a memorial service at the grave of Patriarch Pavle of blessed repose. Many faithful attended the memorial service at the monastery.